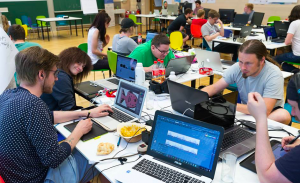 July 03, BJT, the Global VR Hackathon Austria station is successfully concluded. Launched by EYA, an Austrian community collaborating with VRCORE, the campaign has attracted 40 developers from various industries to join in. With the theme of “Water & Family”, 7 demos have been developed within 48 hours. Meanwhile, a remote supporting session was also included in the competition, 7 creative mentors from all over the world, including Rebecca Liu ——the founder of VRCORE , have participated in this session as well. After the fierce competition, <Ship Happens!> eventually took the top spot and won the champion. Its developing team will represent Austria to join the Global Hackathon final contest in China during the August. 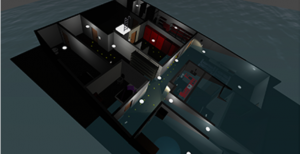 <Ship Happens!> is a cooperative marine escape game developed by Oculus Rift. In order to escape a sinking ship, one must cooperate with another player who won the map. The interaction of this game allows the players to share the VR experiences with their friends. Compared with another famous game <Keep Talking and Nobody Explodes>, <Ship Happens!> requires more and closer collaborations between players. EYA is the leading developer community in Europe. The community is aiming at encouraging more youth and new businesses to create digital contents with real social values. It collects numerous professionals from European Internet and mobile Tech industry. Annually, EYA launches creative development campaign with high specification and it has the potentials to provide new creative solutions for the European association. The deadline of competition application is Aug 31, 2017, there are only 56 days left since today! applicants can apply on the homepage of our official website. 历史的文章历史的文章：Global VR Hackathon Winners from Singapore and Australia Stations are Ready未来的文章未来的文章：The best Lineup Ever! 2017 VRCORE Announced Its First Judge Team!